If you are a long term resident of Wickenburg, things may seem to be changing at a very fast pace. Business’ come and go and residents come and go, but one of the major changes to the Wickenburg landscape is the new Jones Ford location. Many remember and still refer to it as Bromm Chevrolet, but the great recession took care of that once great business. With the closing of Bromm the Jones family took a big risk by deciding to leave there location and head East. The Jones’ had been at there current location for years, but had outgrown it. After looking at the building they knew it was in desperate need of a face lift. So with the help of many local contractors including Mills Painting the project got underway. Mills Painting repainted the complete interior and exterior of the building. We started on the inside. All the new drywall had to be primed and painted. The existing non painted surfaces had to be protected, and everything had to be perfect. After all this was going to be Jones Ford’s largest dealership, and Mills Paintings most viewed building. So Brian, Shorty and the gang got to work. Working under tight deadlines and through the weekend they got it done. The show room sparkles with fresh Dunn Edwards paint, and the offices look professional and clean. A once dingy interior had been transformed in less than six days. After completion of the interior it was off to the outside. The building received some new stucco in places, but not all over. 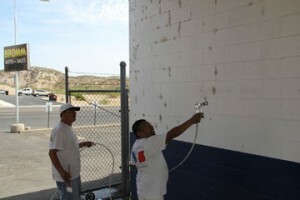 So Mills painting began by power washing and repairing all the old surfaces. There were block, metal and stucco. None the less Mills Painting was up to the challenge. The exterior was primed and painted. Sprayed and back rolled. Mills Painting applied a fresh coat of Dunn Edwards Sparta Shield 10 to the entire building. It now sparkles as you pull up or even just drive by. So the next time you’re thinking of repainting your Wickenburg home or business give, Mills Painting a call. They will make your building look like a million bucks. This entry was posted in Commercial Painting Contractor. Bookmark the permalink.